· Student does not identify the objective. · The student acquires bits of unconnected information that have no organization and make no sense. · This is not a stage that we want to foster through questioning so we will not pursue it further. · Identify, complete simple procedures. · Students make simple and obvious connections between pieces of information. · Count, describe, list, combine, do procedure. · A number of connections are made, but not the meta-connections between them. · Put the list of things into the question. · Ask what they have in common. · E.g., How many sticks are there for 5 houses? · Compare/contrast, explain causes, analyze, relate, and apply. · The students see the significance of how the various pieces of information relate to one another. · E.g., If 52 houses require 209 sticks, how many sticks do you need to be able to make 53 houses? · Theorize, generalize, hypothesize, and reflect. 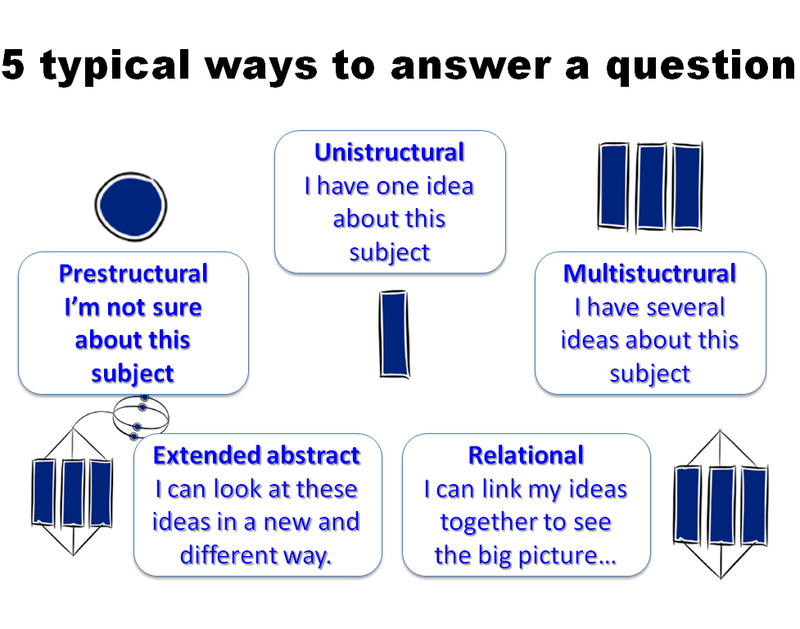 · At this level students can make connections beyond the scope of the problem or question, to generalize or transfer learning into a new situation. · E.g., Make up a rule to count how many sticks are needed for any number of houses.